A total of 24 former Bank Asya shareholders were remanded in prison pending trial over on accusations of membership to the Gulen movement. 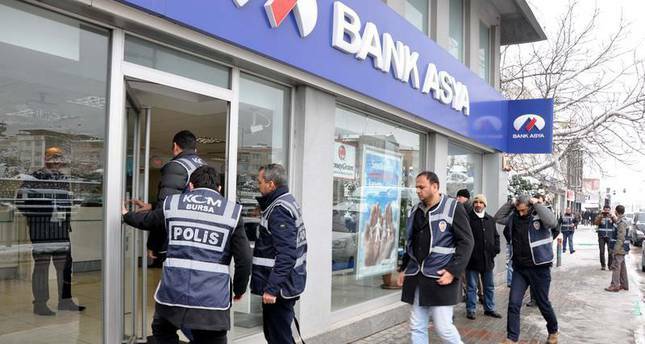 Last week, police detained 49 former shareholders of the now-closed Islamic lender who had authority to elect the executive board and make trade-related and administrative decisions at Bank Asya. Media said Wednesday that 24 of the suspects were put in pretrial detention, 15 were released pending trial while the remaining 10 were freed without any charge. The bank was recently declared bankrupt by a regulatory body. The Savings Deposit Insurance Fund (TMSF) had taken over management of Bank Asya and took control of 63 percent of its privileged shares, enough to name the board, in February 2015. New board members, a general manager and deputy general managers were immediately appointed. In the aftermath of a coup attempt on July 15, 2016, the government closed down Bank Asya on the grounds that it was linked to the Gülen group, accused by the government of masterminding the putsch. The movement denies any involvement in the failed coup.